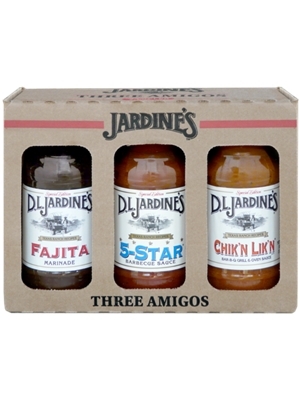 Jardine's Three Amigos Sauce Gift Box contains 3 of Jardine's top sauces. On the grill or in the oven, these guys are truly best friends. With one taste, they’ll be yours too! Indulge yourself or treat a friend . . . or both! The best thing is that you get to pick which 3 sauces are in this tasty gift box. Jardine's Three Amigos are for whatever you are grilling--beef, fish or chicken, this variety of sauces delivers an authentic flavor in every bite. One taste and you’ll understand why Jardine's is always a best seller.